Hey super lady! My co-worker and I are hoping to find new ways to bring out student ideas when they’re writing. What do you do or what do you use? Do you have any professional development suggestions or resources to point us toward? Help! Each year before I start a new school year, I take some time to decide what my personal teaching goal will be. This isn’t usually my “official” goal, but the one I want to live by, the one I think will keep my teaching centered throughout the year. This year, I told myself: “No phony writing assignments.” In other words, have them write letters and proposals, profiles and case studies. And when we write the academic essay, be sure they understand this is what we write for school, but we’d all be hard-pressed to find writing outside of school that stacks five paragraphs on top of each other with predictable topic sentences, rhetorical questions and re-stated thesis statements. Your answer resides in what I can tell you already know: their best ideas are already inside them. I think it’s why you used the phrase “bringing out” because you recognize our writers are ready to develop their ideas, to find their voices. It’s the confrontation we must have with ourselves: if our students already have ideas, but aren’t showing them, what are we doing to inhibit them? It can be really tough to discover your ideas within the constraints of highly structured academic essays. I know this because just this week I sat down to do one of the assignments I’d given to my students and was absolutely stuck. I couldn’t write the darn thing within the structure I had assigned. 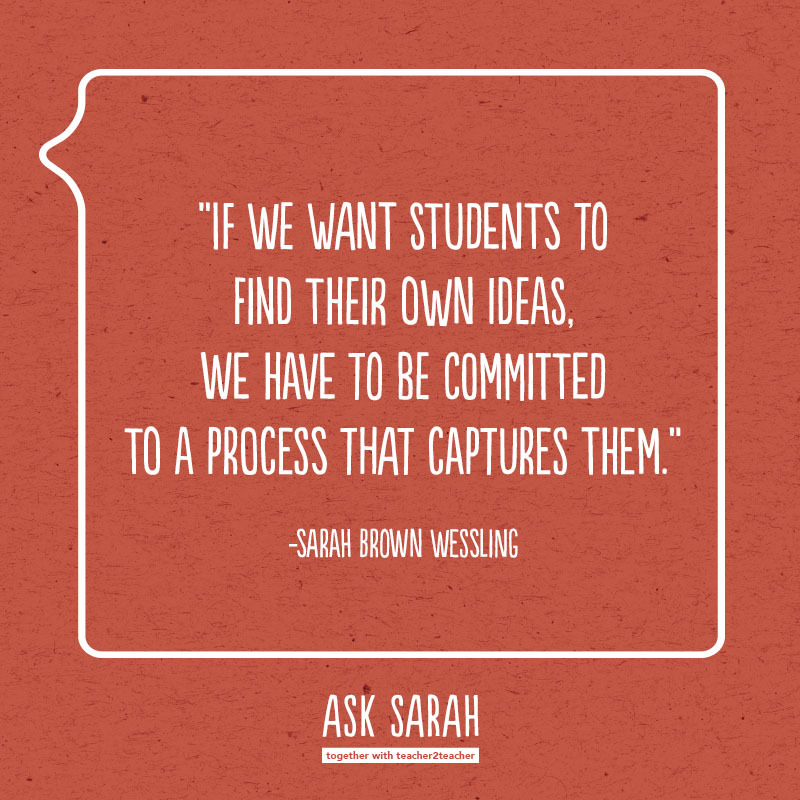 If we want students to find their own ideas, we have to be committed to a process that captures them. Don’t misunderstand me. My students write traditional academic papers too. But it’s not all we do. Whether it’s an academic paper or a another genre, we have to invest in a process to bring out their ideas. Here are some of the ways we plunge into that process. We don’t write in isolation. Our writing is born from responses to all kinds of texts, speeches, articles, and discussions. We talk. A lot. Writers often don’t know where to start until they’ve been able to talk about their ideas, to see how they emerge and change. We work from their questions whenever possible. This means there may be 30 different paper topics in one class period, but it also means they will probably be more invested in the writing that emerges from their own curiosity. We pitch ideas and get feedback on our thinking early in the process. We try to vet our ideas, learn how to look for gaps in our thinking, abandon and build. We work really hard to create audience that isn’t me. It’s one of the quickest ways to damper their ideas. Something clenches their process when writing for a grade becomes their main motivation. I can’t alleviate that entirely, but I can lessen it when we shift the audience. We create authentic purpose for writing, which is often born out of the audience we’re writing for or the resources that inspire the writing experiences that find their way into our classroom. You asked about resources and I have to be honest, my best resources most often come from the writers I meet as a result of my own reading habits. I’m always looking for the next “non-phony” writing experience to bring to class. It’s our version of NPR’s “You Have to Read this Book” or Outside Magazine’s profiles. It’s the TEDTalk or the Shark Tank persuasive pitch. Bringing out student ideas reminds me of Doris Lessing’s quote: “That is what learning is. Realizing something you’ve always known, but in a new way.” It’s audience and invitation. It’s purpose and process. It’s choice and patience. It’s offering the space of authentic experiences where they have room to find themselves.